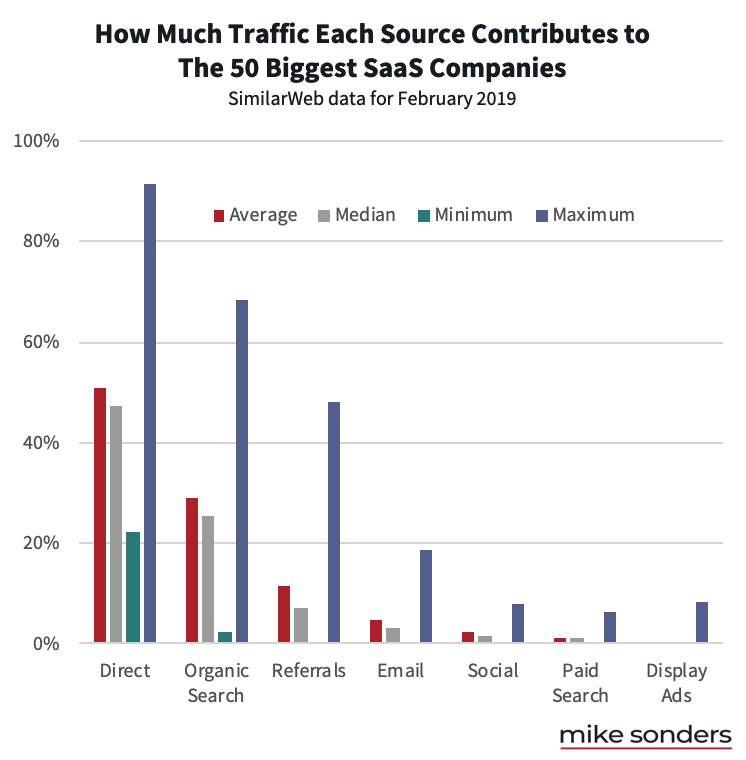 What are the best sources of traffic for SaaS companies? Of course, traffic is meaningless if it doesn’t convert to leads and–ultimately–customers and revenue. And every major source of traffic is different in terms of (1) how quickly it can generate leads once you start investing, (2) scalability, and/or (3) potential return on investment (ROI). get the most cost-effective impact (including lead generation) out of the traffic channels you decide to target. Basically, I’m going to give you the shortcuts to designing a digital marketing strategy for your SaaS business that makes the most of your time and money. Starting with a list of large SaaS companies compiled by Cristoph Janz, I identified the 50 biggest public SaaS companies by market capitalization in the U.S. as of the end of February 2019. Then I pulled desktop traffic data for those 50 websites using SimilarWeb, and supplemented that data using other competitive intelligence tools. SimilarWeb’s 3rd-party insights aren’t perfect, but since we’re looking at averages across a substantial number of large websites, we can comfortably draw conclusions about the scale of difference between the different traffic sources for these websites. All of the raw data is available here. 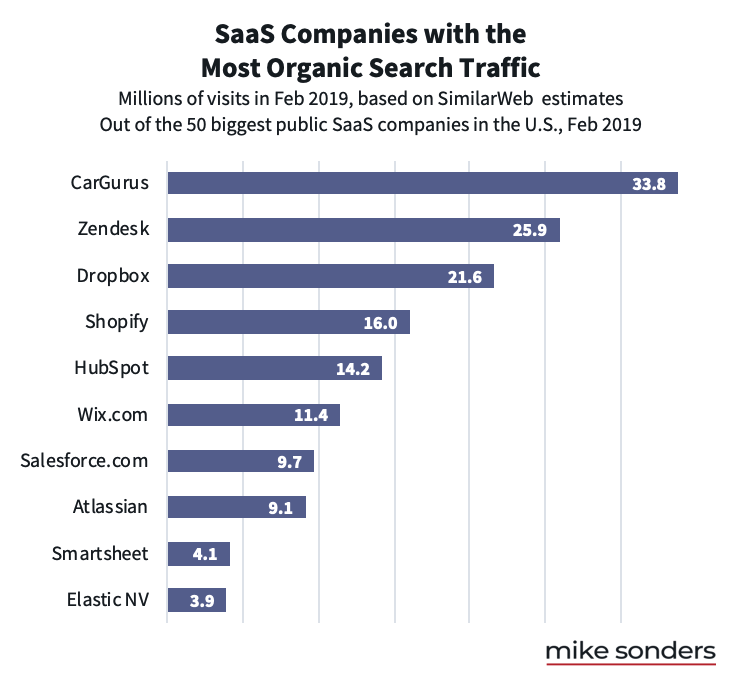 Organic search (i.e., Google) is consistently the biggest source of traffic, new visitors, and often leads for these SaaS businesses, driving up to 68% of traffic. 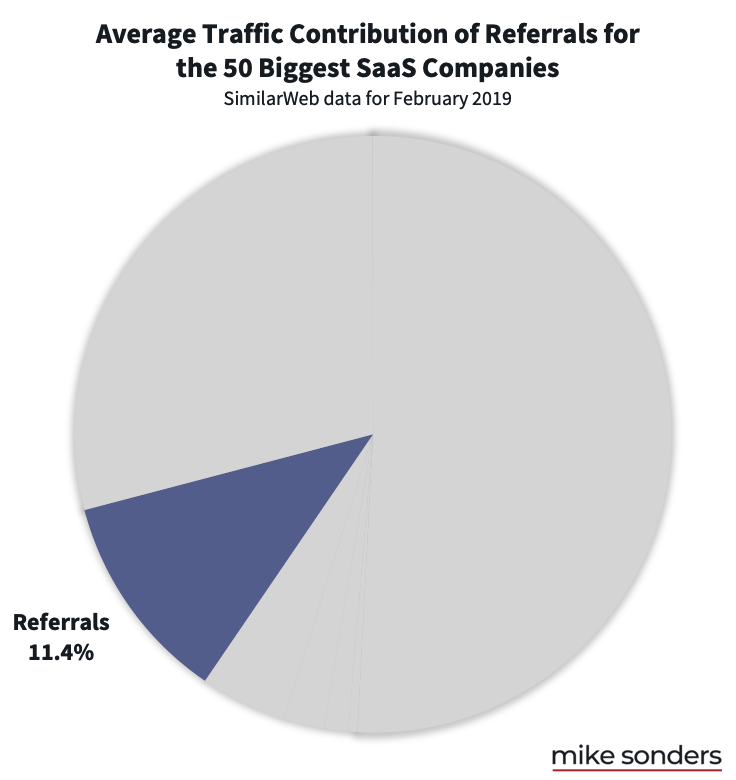 Referrals: The companies getting the highest share of traffic from referrals (up to 48% of traffic) have baked referrals into the core workflows of their products. Email accounts for less than 5% of traffic, on average, but has an incredibly high ROI, upwards of 3,800%. 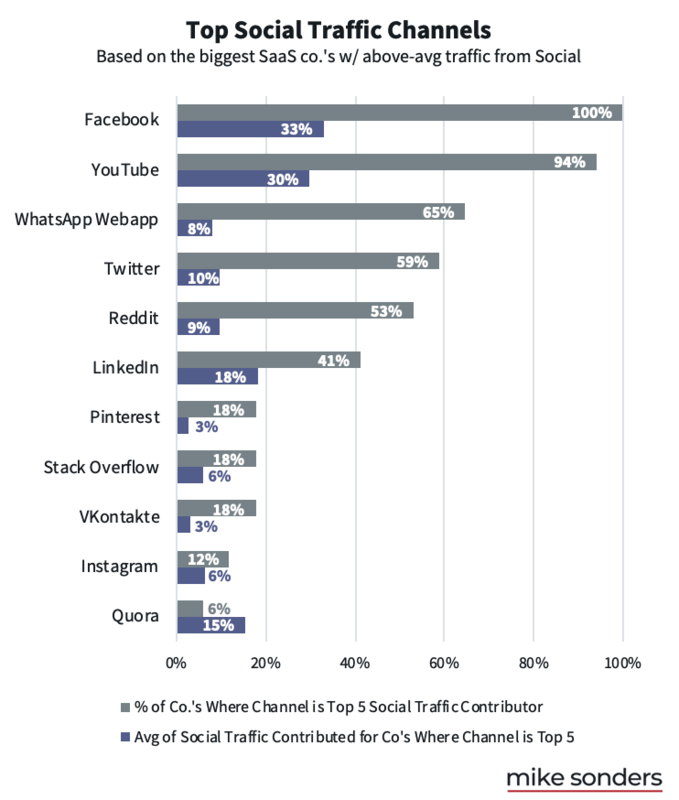 Social media: In terms of sending social traffic, YouTube is second only to Facebook for most of these SaaS companies. Digital advertising: 94% of companies have run paid search campaigns in the past year, but only 72% of the companies run display ads–making it the least-adopted source of traffic in the dataset. 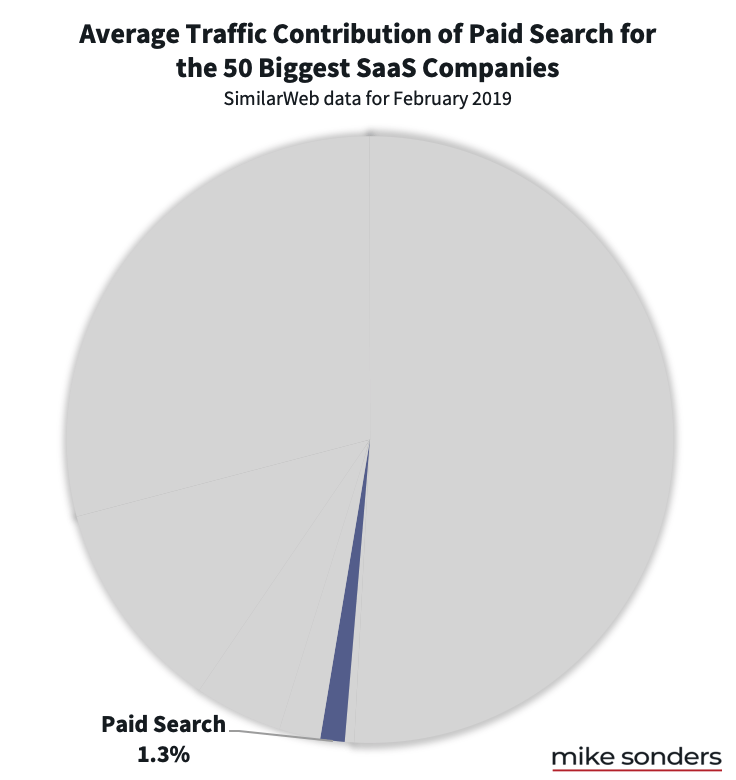 Direct search – 50.8% of traffic, on average. Note: I discuss below why the big number attributed to direct traffic is misleading. Now that we’ve reviewed the highlights, let’s dig deeper and unpack the data to uncover actionable insights for your SaaS marketing strategy. Direct might look like it could be a big, important user acquisition channel, but don’t be misled. In reality, there’s a relatively small number of new visitors who learn about a SaaS business (e.g., via an ad or word-of-mouth) and then type the business’s URL into a browser. 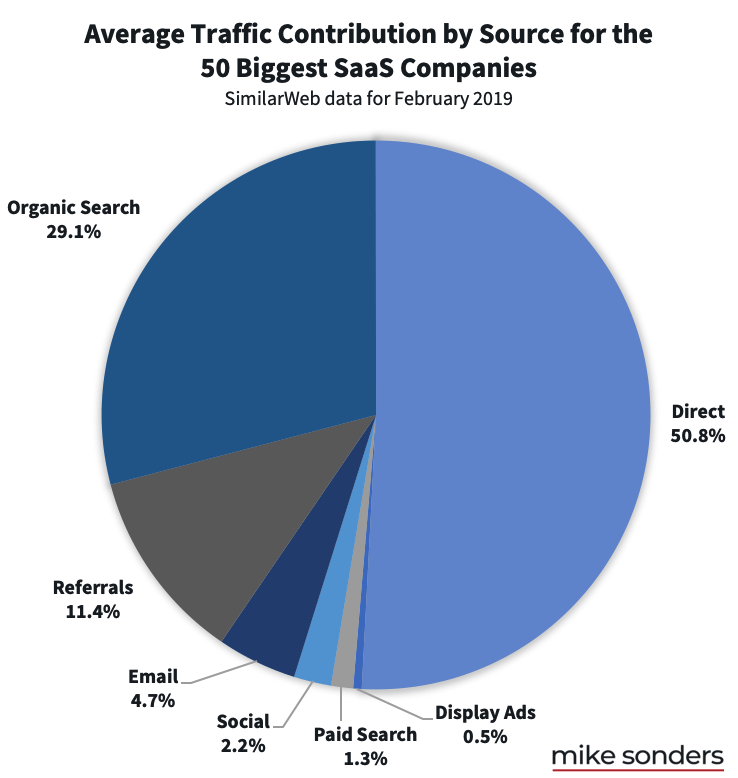 For SaaS websites, most direct traffic is either returning customers or misattributed traffic from other channels. In my experience, for established SaaS websites the majority of (valid) direct traffic is returning customers typing a URL into a browser or clicking a browser bookmark. After all, the SaaS website is often also the product. The direct channel is artificially inflated, since it’s a catchall for all traffic with missing attribution data (which can be a lot of traffic). Misattributed direct traffic often includes visitors from organic search, emails, native mobile apps like Facebook or Twitter, text messages, Slack and other messaging apps, offline documents like PDFs, other non-web-based links, and secure (HTTPS) sites going to non-secure (HTTP) sites. Like I said… it’s a lot. It’s difficult to overstate the importance of organic search traffic to the success of SaaS companies. Controlling for the noise from the direct channel, search engines are the single biggest source of traffic from new visitors to the top SaaS websites. And it’s not even close. 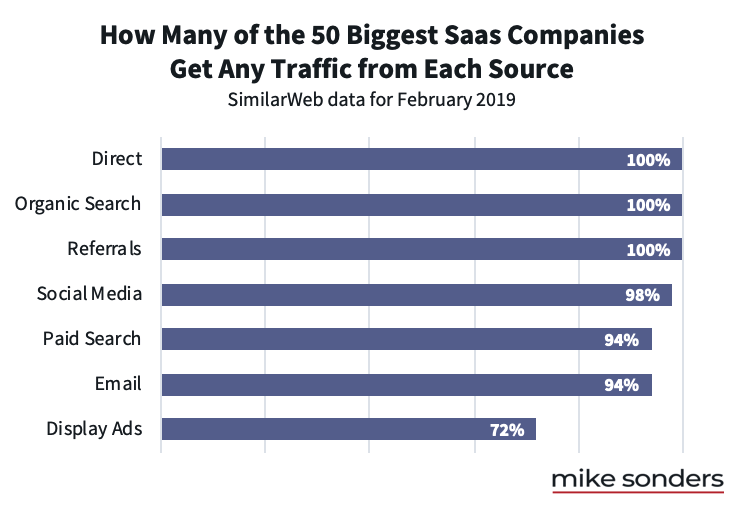 On average, the biggest SaaS companies get over 29% of their traffic from search engines (and a median of 25.6%), which is almost 18 percentage points better than the next-best channel, referrals. Of course, when I say “search engines”, I really mean “Google”, since Google properties account for over 90% of web search volume. So from this point, I’ll use “Google” and “search engines” interchangeably. Search is a hugely scalable channel for SaaS businesses. It helps that everyone you know uses Google whenever they have a question about just about anything, producing at least 2 trillion searches per year. Please take the specific numbers from SimilarWeb with a grain of salt, but we can make confident conclusions about the scale of opportunity in this channel. Thanks to its scalability, organic search can account for a huge, majority share of traffic to a SaaS company’s website. 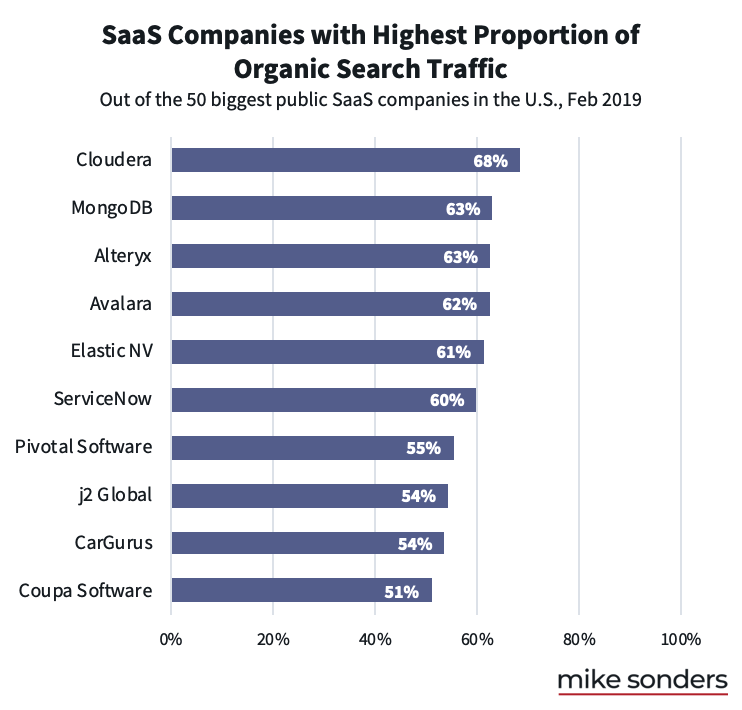 For example, Cloudera gets around 68% of its traffic from organic search–no other (non-direct) channel dominates the traffic mix like that among these 50 companies. The referrals channel is the closest contender, maxing out at 48% of traffic (for Docusign). The magic of organic search isn’t just scalability; it’s compounding effects. Traffic lifecycle of content with >100K lifetime views. The big blue area represents traffic from organic search. Data and image via Andrew Tate at animalz. An effective piece of content–whether a marketing page or a blog post–can enjoy (increasing) organic search traffic for months and even years. When you consistently produce good content, the organic search traffic effects start to compound. That’s how sites like Backlinko can publish fewer than 200 pages of content and still get upwards of a half-million visits per month–by following a content strategy that respects and leverages the power of organic search. So how well can organic traffic convert to leads? When I ran SEO and content strategy for a business unit of SurveyMonkey in 2016, we generated 30K visits per month from Google within the first year of operations, and that organic traffic from Google generated over 95% of the business’s leads. That’s probably a bit of an outlier, given that we were early-stage company going all-in on content marketing, and hadn’t developed other, robust channels and digital marketing practices. So consider Atlassian, one of the top five biggest public SaaS companies, where–according to Atlassian’s former Head of Technical SEO, Kevin Indig–organic search traffic accounted for over half of sales in 2017, the most recent year for which I could find data. A 2019 study of 277 digital marketers found that content marketing and SEO were rated the “most effective” marketing practices, and were the areas most-expected to see increased investment in the next year. In a 2017 survey of 179 B2B digital marketers, 70% of respondents said that organic search was important for generating leads, second only to email (73%). 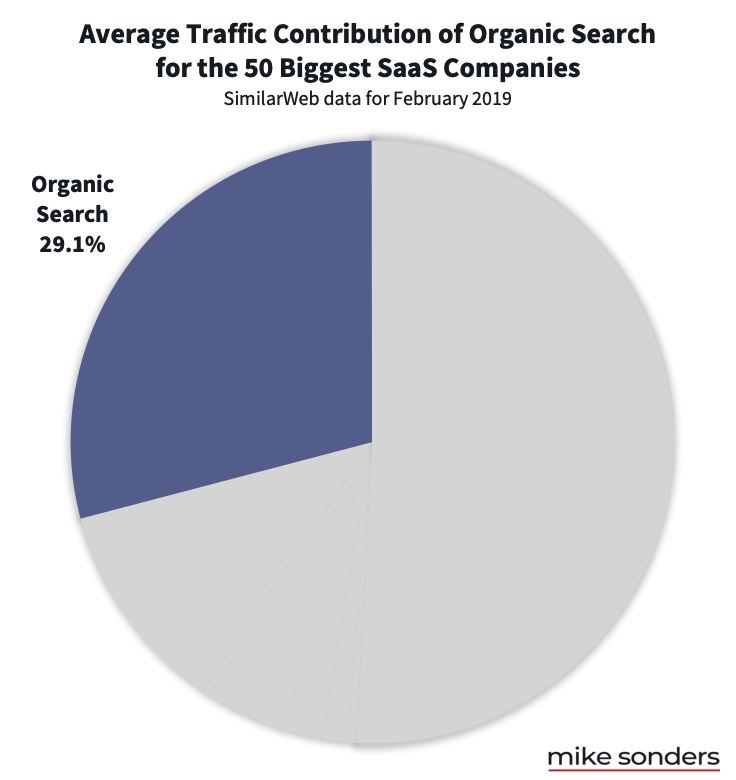 So organic search traffic is hugely scalable–thanks to both the ubiquity of Google and to compounding effects–and can be a significant driver of lead generation for SaaS companies. The challenge is that SEO is a long-term investment–it takes a while to generate meaningful search traffic for newer websites, even when you know what you’re doing. When there’s pressure for short-term growth and/or positive cash flow, SEO can seem less appealing since it doesn’t have an immediate payoff. But now that you know the importance of organic search traffic and SEO to successful SaaS companies, you know that the sooner your company starts investing in SEO, the sooner you’ll start seeing the long-term benefits. Referral traffic arrives on your website via links on other websites. 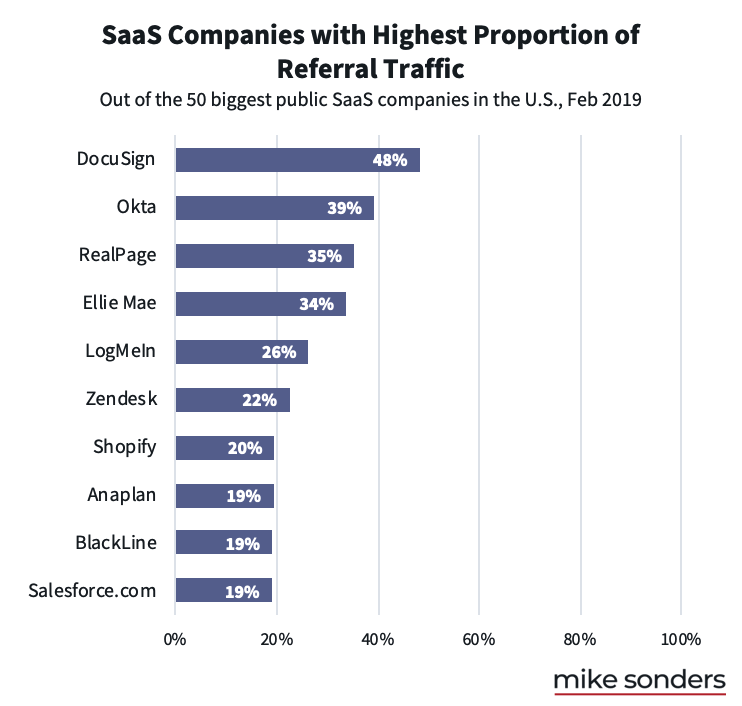 On average, the biggest SaaS companies get 11.4% of their traffic from referrals, which makes it the 3rd-biggest traffic source, on average. Posting in online communities (e.g., Reddit, Facebook Groups, HackerNews) and forums. When you’re first starting out, it takes a notable amount of work to earn links back to your site. Thankfully, as people come to learn about and trust your brand and content, you’ll earn links at an increasing rate without even asking for them–but that flywheel effect takes time to happen. Relevance: How relevant is your link to the audience of the referring content? Traffic: How much traffic from relevant audiences does the referring content get? Surfacing: How well your link is surfaced in the referring content? The most scalable way to generate referral traffic is to build it into the core workflow of your product. Docusign customers refer their vendors, partners, etc. to the Docusign website to e-sign legal documents. Company IT teams point employees to subdomains on the Okta’s website for Single Sign-On (SSO) access to various company apps. Property managers using RealPage point their residents to the RealPage website to pay rent, submit service requests, and more. Not only are these companies generating scalable referral traffic, they’re also building brand awareness and affinity, which have their own multiplier effects. Even links that don’t send referral traffic often have important value for SEO–which is partly which guest posting is so popular and sometimes abused. Google has explicitly said that backlinks are one of the top three ranking factors in its search algorithms. The more backlinks your site gets from relevant, authoritative sites, the more authoritative your site becomes–making it easier to rank on Google for your target search terms. 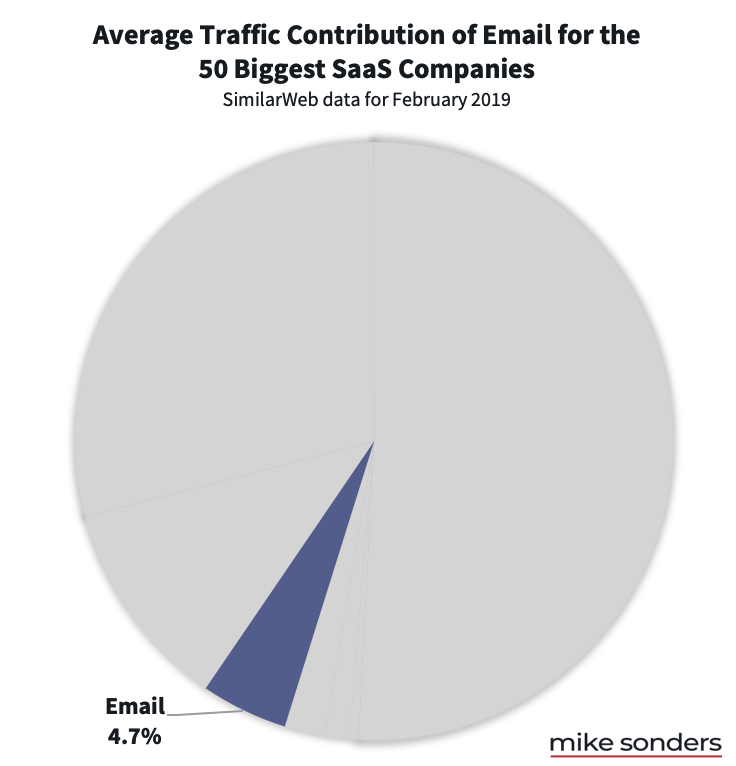 On average, the biggest SaaS companies get 4.7% of their traffic from web-based email clients. There are two major flavors of emails: warm and cold. Warm emails–often synonymous with “email marketing”–are the ones you send to your “owned” email list. That is, the people who have opted-in to hear from you, e.g., by signing up for your newsletter, downloading a whitepaper, signing up for a webinar, starting a free trial, becoming a customer, etc. Recent research indicates that the ROI on email marketing is 38:1, which is pretty damn good (and steady from levels reported in research done in 2015). If you’re a relatively new SaaS startup, I recommend having a deliberate and specific plan to grow your owned email list (e.g., via lead magnets like ebooks, webinars, whitepapers, newsletters, and other free resources) and to nurture it–it’ll become one of your most valuable marketing assets. Think about how nice it’ll be to have an available, warm audience for promoting your content, new features, promotions, events, etc.. Plus, your owned list of lead emails will probably be your first list large enough to test in paid lookalike campaigns. But nurturing your list is key. I see plenty of startups–and I’ve been guilty of this myself–build email lists and then ignore them. People will forget about you! A biweekly newsletter that adds value for your target audience is a manageable way to stay front-of-mind. Because many people on your list may not be looking to buy today, but you never know about a month or year from now. Most of the channels discussed so far are key to inbound marketing strategies, but this one’s a notable and important exception. Cold email campaigns (a.k.a., “outbound sales” or “sales emails”) are ones that you send to people who haven’t had any apparent prior contact with your company. Note: There are tools that allow you to see the companies who have visited your website (Google “website visitor tracking software”), but I still count outreach to individuals at those companies as cold if they haven’t opted-in to any of your offers. Systematized outbound email processes are a critical component of growth for many SaaS companies. Even Hubspot, which built its brand trumpeting the superiority of inbound marketing and generally talking smack about outbound marketing, admitted to using outbound techniques as early as 2010. Outbound works for generating leads, and cold emails make outbound really scalable. You’re much better off building your own cold email lists comprised of proven buyer personas who work at companies matching your ideal customer profile (ICP). You can use a lead gen service or tool, or implement your own process for finding prospects and emails at scale using LinkedIn. Prospecting: The teams getting the best response rates spend meaningful time finding, qualifying, and researching prospects. You can’t fully automate this process; it requires work from actual humans. Personalization: The extra time researching prospects can pay off nicely. I’ve seen this myself (having been on the sending and receiving end of cold emails), and it’s substantiated by research: One Buzzstream study of 12,000 email outreach campaigns found that emails with contextually relevant personalization got 10.7% higher reply rates than emails with basic merge-field personalization (“Hi [first_name], …”). Optimization: Plus, you’ll want to constantly A/B test every aspect of your emails–sender name, subject line, copy, CTAs, send time, and more. Something as simple as optimizing your subject line can more than double email open rates. Meanwhile, a high proportion of people will send your email to spam oblivion if they don’t like your subject line. Deliverability: It’s critical to adopt processes that help maintain your email deliverability and avoid domain blacklisting. I’ve seen firsthand how much effort goes into creating a scalable outbound sales process that actually works and has positive ROI. It’s not my area of expertise (my work is focused on inbound marketing), but I know consultants who specialize in systematizing and optimizing cold email outreach, so feel free to drop me a note if you’d like a referral. I always cringe a little inside when I hear someone in a B2B SaaS startup talk about “developing a social media strategy” as if organic (non-paid) social media marketing will be a meaningful driver of business. 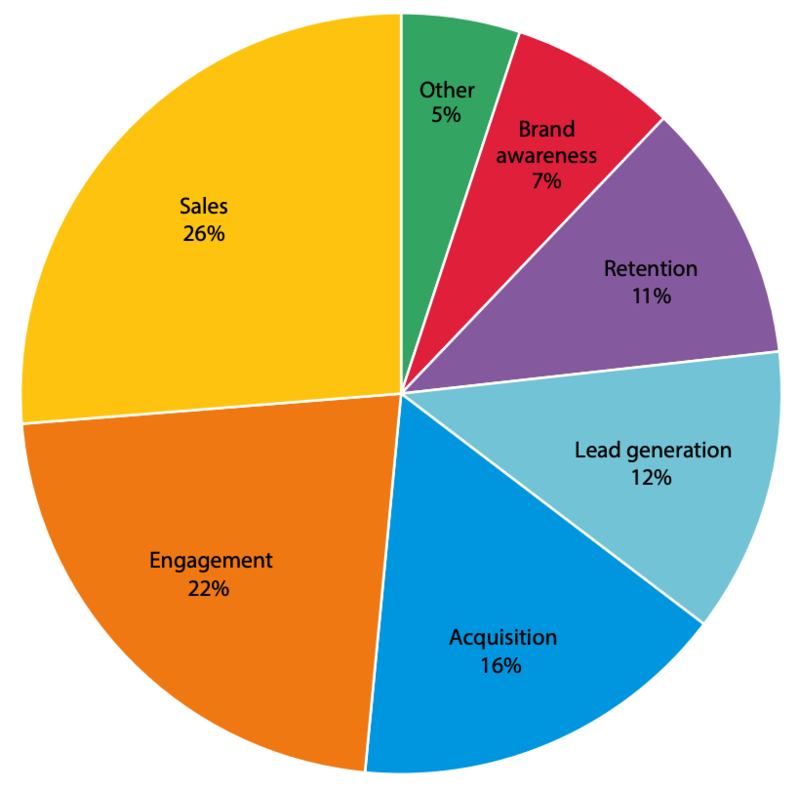 Organic social will not be a meaningful driver of leads or revenue for your B2B SaaS business. Any successful, scalable social media marketing strategy for B2B involves spending money. Thanks to algorithmic changes and constantly-increasing competition, the average reach of a post on the big social platforms has cratered in recent years, resulting in paltry engagement rates. 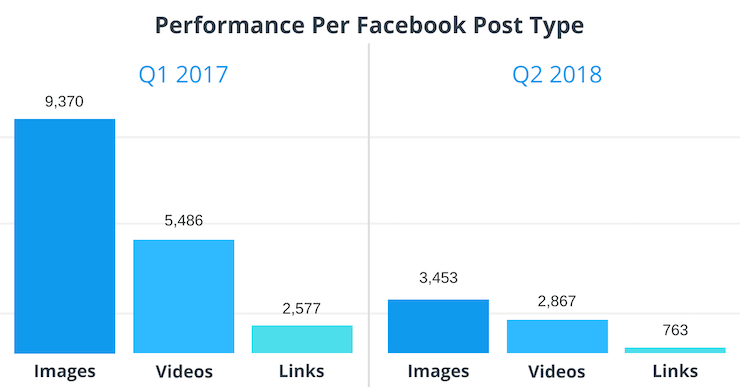 In a study of 43MM Facebook posts, Buffer and Buzzsumo found that engagements per post declined 65% over the 18 months leading up to Q3 2018. Now–according to a 2019 study looking at 4MM social posts across 12 industries–the average engagement rate per post on Facebook is just 0.09% and the rate on Twitter is 0.048%. So businesses have a really tough time getting organic social posts in front of even a tiny fraction of their followers or fans. Correspondingly, social media (including both organic and paid) drives only 2.2% of traffic, on average, to successful SaaS businesses. I’m not saying you should ignore the big social channels–they can still be valuable in ways I’ll describe below. Just don’t expect to uncover a repeatable process that makes organic social a scalable driver of leads and revenue. A lot of people turn to social media for customer service or to complain about companies. When a company fails to respond, it can put your churn rate at risk. Conversely, people are more likely to recommend your brand when they get a quick response. So do your business a favor and have a social media customer service process in place. Potential customers evaluating your brand: Have you ever checked out a company’s profile on Twitter, and they haven’t posted anything for months? It doesn’t exactly instill confidence. Having an active social presence signals that your business is a going concern–not some struggling startup on the verge of death. Plus, your activity gives you an opportunity to signal your business’s positive qualities. People who follow you on social because signing up for your email newsletter was too much of a commitment: These folks want to read (and sometimes share!) your content, get your industry insights, and maybe even hear about your product updates. Treat social like a lead-nurturing tool–stay front-of-mind and demonstrate your value. You’ll never believe who seemingly out of the blue ends up paying for your service after quietly following you for months or years on Twitter. Social network algorithms tend to reward engagement. Better engagement increases the reach of of your organic posts… and makes your paid posts more cost-efficient. Every social platform is different (e.g., on Facebook these days, videos and images tend to get better engagement than links), so do your research and test, test, test. At a minimum, I recommend having a brand presence on the platforms where people tend to look for and follow B2B brands–Twitter, Facebook, and LinkedIn. In B2B SaaS marketing plans, YouTube tends to be an afterthought. 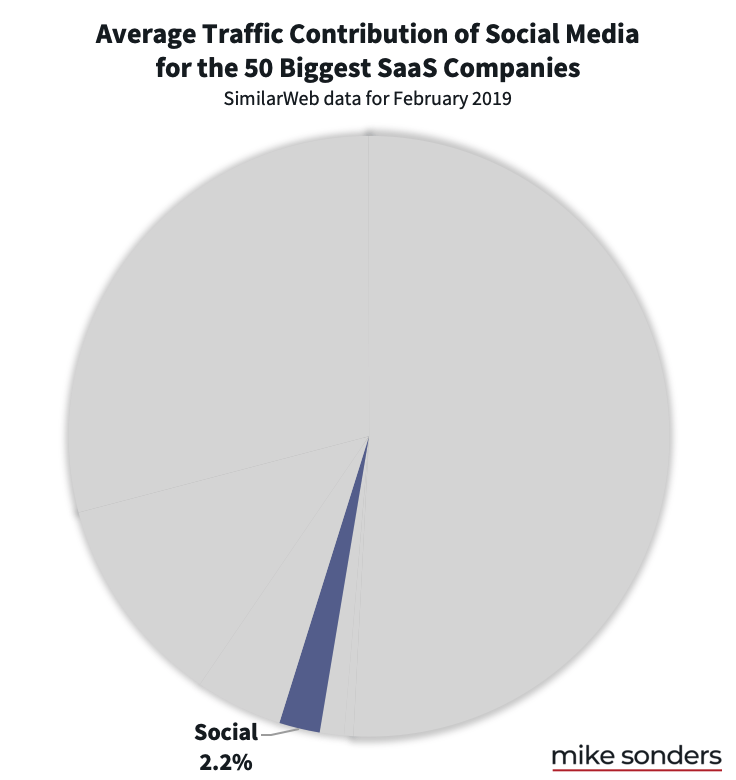 But did you notice that it’s a top 5 contributor of social traffic for 94% of the SaaS companies in the dataset? YouTube is a top 5 contributor of social traffic for 94% of the most successful SaaS companies. For B2C brands, it could make sense to maintain profiles on Instagram and/or Pinterest. Any scalable processes for nurturing and converting leads on social media involve spending money. Ad units like Lead Ads make it relatively easy to quickly start collecting leads without even having to publish a landing page. Test advertising campaigns that target different lookalike audiences (i.e., people who resemble the people who have already shown interest in your product or brand). In my experience, lookalike audiences tend to perform better than audiences that are simply interest-targeted… but test, test, test! I’ve been pleasantly surprised in the past to get positive ROI for a B2B SaaS using Instagram ads–you never know what’ll work for a particular business until you try. Remarketing (a.k.a., retargeting) can be a very cost-efficient way to cultivate and convert leads who have already shown interest in your SaaS’s offering. Test remarketing different offers and content to people who have interacted with your brand online. Facebook, Twitter, LinkedIn, Google, and even Quora all have retargeting programs. When you have an organic post enjoying better-than-average engagement, improve its reach by paying to promote it. You’ll not just be able to get more (cost-efficient) traffic, but also more followers–which gives you a bigger audience to which you can promote your content. A little progress every day adds up to big things, after all. Paid search ads are the ones marked “Ad” that show up in some search results on Google and other search engines. You might see these referred to as “pay per click” / “PPC” or “Google Adwords”, though Google has replaced the Adwords brand with “Google Ads”. 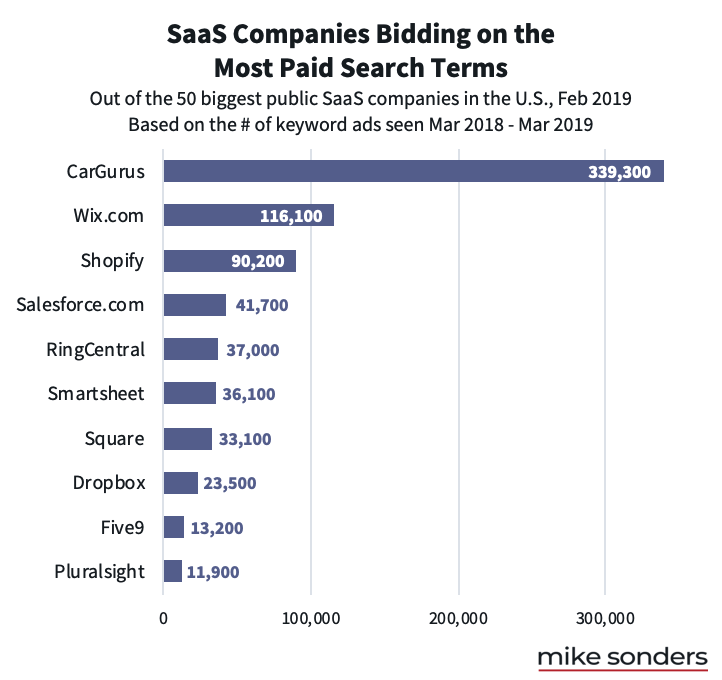 94% (or 47) of the 50 biggest SaaS companies have run paid search campaigns in February of 2019. Unlike the case with organic search, Google is not the only game in town when it comes to paid search. 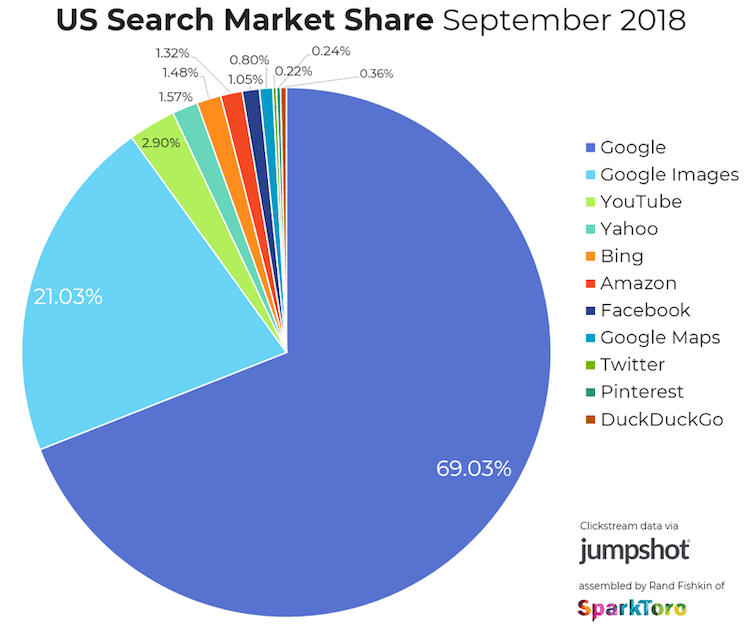 Thanks to lower prices, most of these SaaS companies bid on more search terms (“keywords”) on Bing and Yahoo’s ad platforms than on Google’s. The SaaS companies bidding on the most keywords in Google Ads tend to target consumers, sole proprietors, and small businesses–after all, there are a lot more of these businesses than there are enterprise businesses in the world. But there’s no minimum requirement for starting out–you can get into the paid search game targeting just a handful of keywords. And there are plenty of 3rd-party services (Unbounce, Instapage, Leadpages, for starters…) that make it easy to generate a landing page. Paid search can be particularly handy for early-stage startups who have a bit of a budget and need more leads, but haven’t yet developed their other marketing assets and channels. It’s a relatively quick way to test messaging and copy, and to get the company’s messaging in front of people with high purchase intent. Ad-click prices (costs per click, or CPCs) are getting quite expensive–upwards of $100–in many SaaS verticals, so the keys to getting positive ROI with paid search are (1) finding affordable keywords with high purchase intent and (2) optimizing the hell out of your acquisition funnel. For quicker conversions, focus your spend on a handful of search terms that that people use when they’re deep in the buying process. For example, you could create content that compares your solution to those of the better-known competitors in your space. 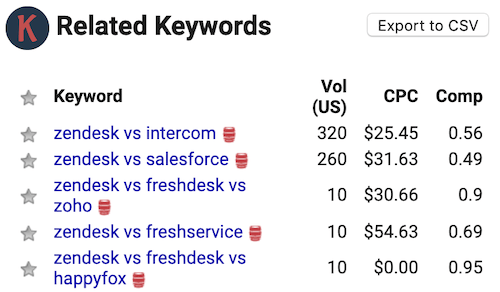 Bid on the branded “vs” search terms of your competitors (e.g., “zendesk vs”) to put your lesser-known solution under consideration. Keywords Everywhere is a handy, free Chrome extension for finding attractive keywords. It shows monthly search volume and cost-per-click (CPC) data from Google right below the search box. To help you find other keywords to target, Keywords Everywhere shows a list of keywords related to the search term you enter into Google on desktop. 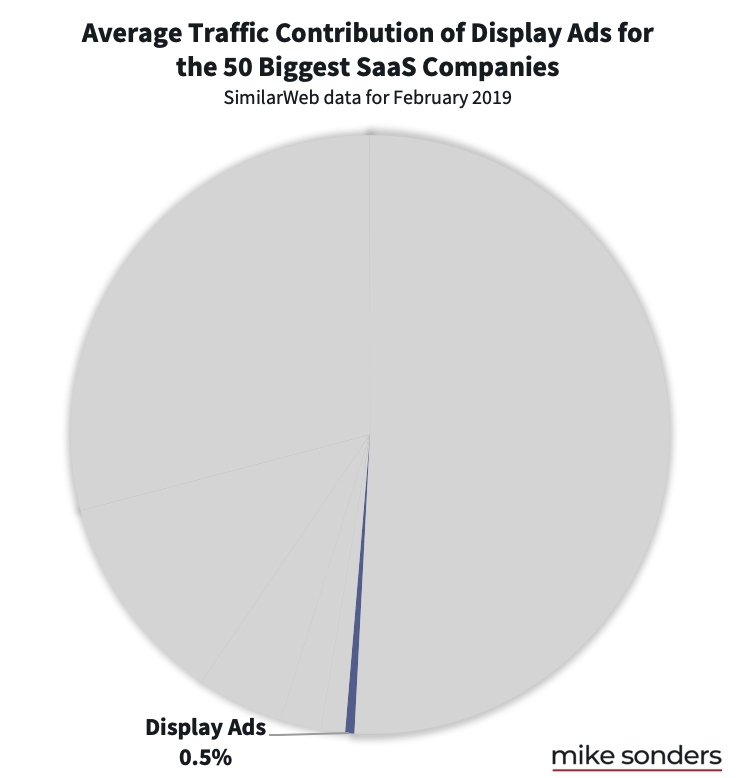 Display advertising doesn’t make economic sense for every business and market, and that’s clear from the dataset: more than a quarter of the biggest SaaS companies don’t appear to be running any sort of display ad campaign. 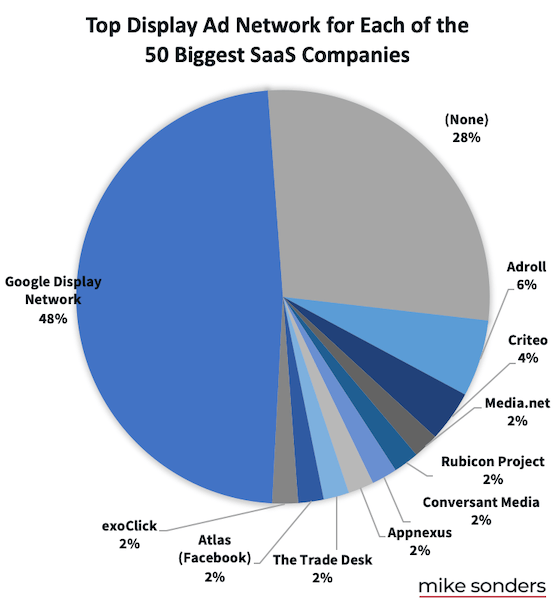 For the majority of companies that are running display ad campaigns, the Google Display Network is the ad network driving most of their ad traffic. There are quite a few challenges with display ads–with all types of paid digital advertising, in fact–which help us understand why some companies avoid developing display ad campaigns. Unlike other digital marketing channels, ads aren’t an investment–they’re an expense. Ads aren’t like SEO and referrals, where traffic and lead generation can continue (and even grow) even if you stop investing–as soon as you stop spending money on ads, you stop getting leads. Ad fatigue means continuous overhead costs. You can’t just continue to spend the same amount of money on an effective ad campaign and expect consistent results over time–thanks to ad fatigue (people getting tired of your ads) you’ll need to consistently refresh your ad creative to get and keep the attention of your target audience. Competitors can quickly bid up your costs. If and when a competitor increases their ad spend, prices get bid up and you’re looking at higher customer acquisition costs and a longer payback period. The only winners in this scenario are the ad network and your ad agency. You get diminishing returns on your money as you scale up. Once you’ve develop a successful campaign, you can’t just throw more money at it and expect similar results at a larger scale. As your spend increases, getting the same results becomes more expensive. There’s a limited number of people in your target audience who are anywhere near ready to consider your offering. Once you’ve reached them, you’re showing ads to people who are less likely to convert, which lowers your conversion rates, increases your acquisition costs, and reduces the ROI of your campaigns. Now that you know the major sources of traffic, let’s do a quick walk-through of quickly using Google Analytics to see the sources of traffic for your own website. Not using Google Analytics, yet? I highly recommend using Google Tag Manager to deploy Google Analytics–along with any other tracking tags for services like Facebook, Intercom, Drift, etc.–on your site. If you’re not familiar with Google Tag Manager, Hubspot’s got a great overview and setup guide. Because you care about the value of your traffic and how many qualified leads it’s generating for your business, I also encourage you to set up events in Google Analytics to track important conversion events on your site, like completing a form, starting a free trial, or becoming a paying customer. Once you’ve got analytics set up, we can quickly get an overview of how much traffic each source sends to your site. 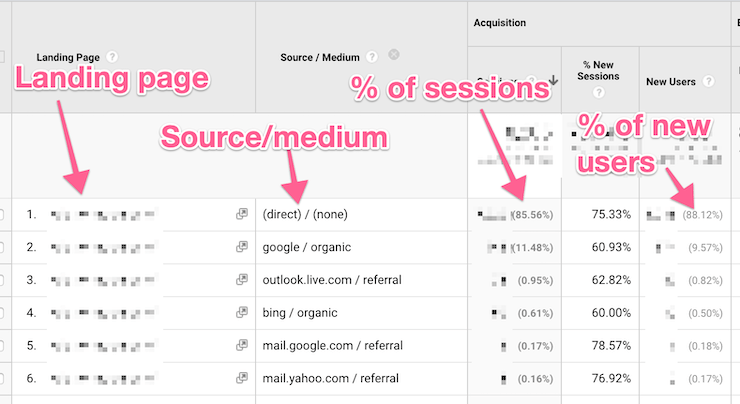 Assuming you’ve set up events to track important site conversions, you’ll also be able to see (usually in the right-most columns in this screen) the conversion rate and number of conversions attributable to each source of traffic. This is a really quick way to keep tabs on how much each traffic channel is contributing to customer acquisition. In the example above, organic search gets credit for 73% of unique users visiting the site in the given time period, and that traffic converts to the selected goal (in this case, a free trial) at a rate of 7.6%. Navigate to Behavior > Site Content > Landing Pages, and then filter the list of landing pages to the one (or ones) you’d like to analyze (e.g., “pricing” or “blog”). 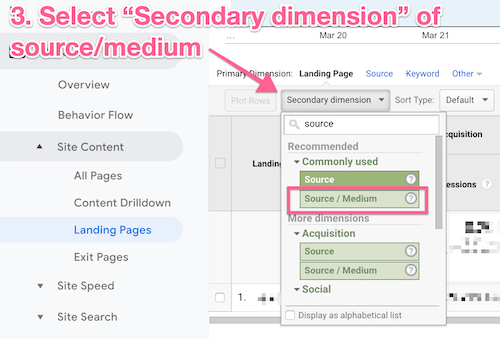 Once you’ve filtered the list to the desired page (or pages), click the “Secondary dimension” button and add a dimension of “Source / Medium”. Note: You could also use “Source”, but that doesn’t provide as much helpful detail. For example, all organic and paid traffic from Google would be rolled up into a single, undifferentiated source of “google”, versus seeing separate “google / organic” and “google / cpc” traffic with Source / Medium. Voila. Now for the landing page you’ve selected, you can see the percentage of sessions and new users attributable to each traffic source, plus conversion rates for each source (not shown). Just a reminder: You can improve the attribution of your traffic by adding UTM parameters to the links in your marketing campaigns (just not to your site’s internal links). Email: Warm emails have incredible ROI; methodically work your way through the customer journey and figure out how to add value with automated emails at every stage. Not all SaaS companies conduct cold email outreach, but more probably should. Outbound marketing works, and email makes outbound scalable. Meanwhile, paid channels can be a very effective growth accelerant, especially when you’re still getting traction with the “bigger” channels like organic search and referrals. Just don’t expect paid channels to form the long-term foundation of your marketing strategy. As you develop new sources of traffic for your SaaS business, brace yourself for a period of disappointing results as you learn, iterate, and optimize your process. For the most part, you can’t expect to run a couple of small tests in a new channel and expect to develop any meaningful insights. It takes time to build a scalable customer acquisition machine. Need some extra guidance in any of these areas? I’m a growth marketer who specializes in SEO consulting for SaaS, so get in touch.